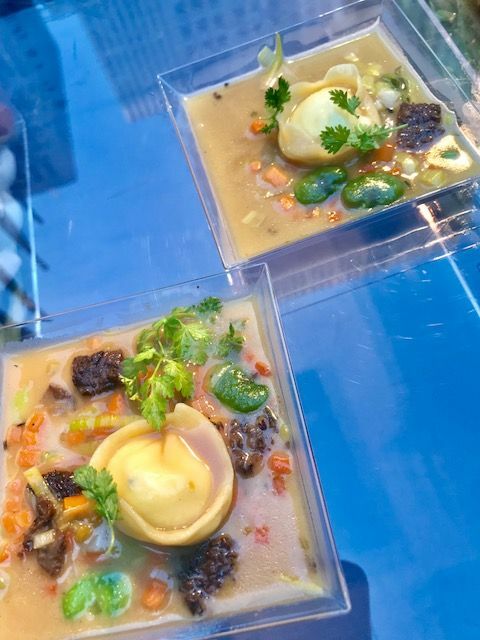 Alfred Portale’s goat cheese tortellini with morels and spring vegetables at The Grand Affair. 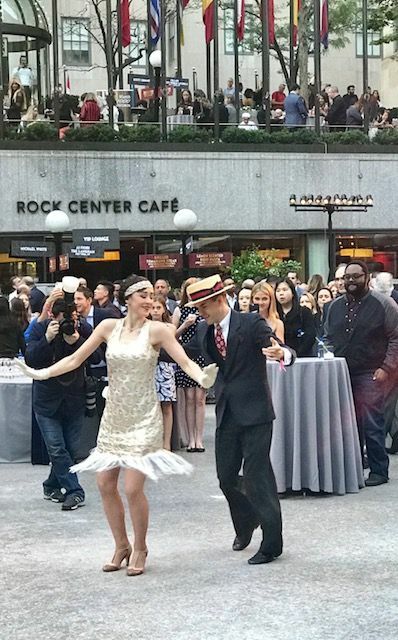 It’s 7 pm Monday, June 11, on the esplanades above the Rockefeller Center Gardens. 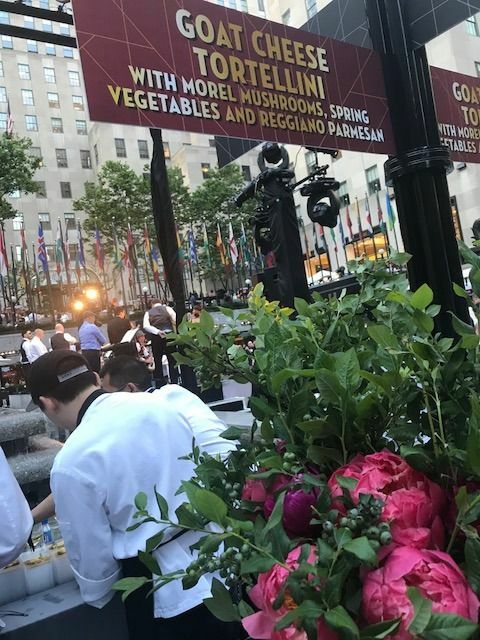 Chef Vito Mollica from the Four Seasons Hotel Firenze is dishing out gnocchetti pasta cacio e pepe, and across the way, Chef Ed Cooney of the Merrion Hotel in Dublin offers braised lamb croquettes with pea salad and mint pesto. Signage by David Rockwell and his team helps the eager crowd find the chefs they seek. 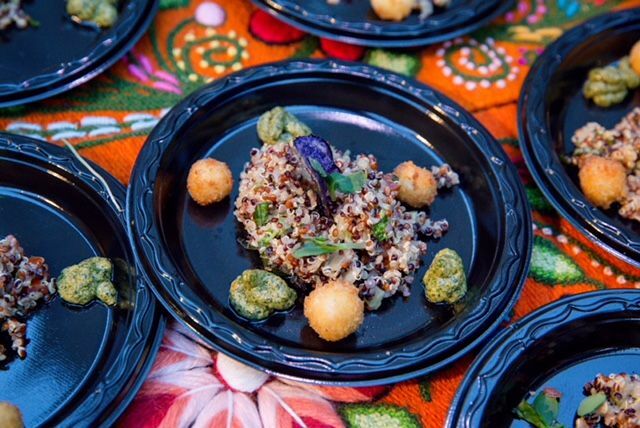 Carlos Pardo of Sumaq Machu Picchu Hotel serves quinoa tabbouleh with Andean flavors. On the opposite esplanade, Hélène Darroze from The Connaught in London, Paris and Moscow lines up saucers of cauliflower panna cotta with caviar and sea urchin emulsion next to the setting where Vineet Bhatia from Dubai, Geneva, London and Mumbai and elsewhere is dispensing butter chicken with turmeric-cumin pilau and crisp spiced peas. 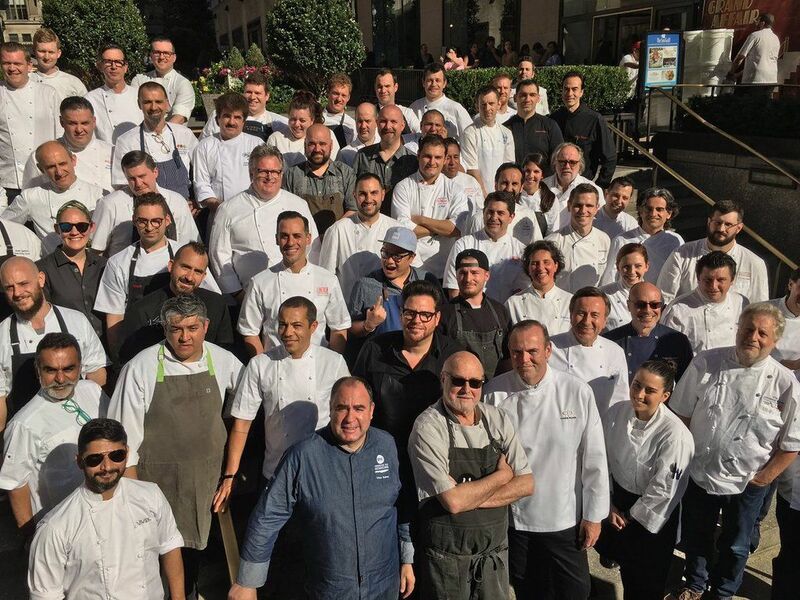 The chefs gathered to pose just before the VIP guests arrived. 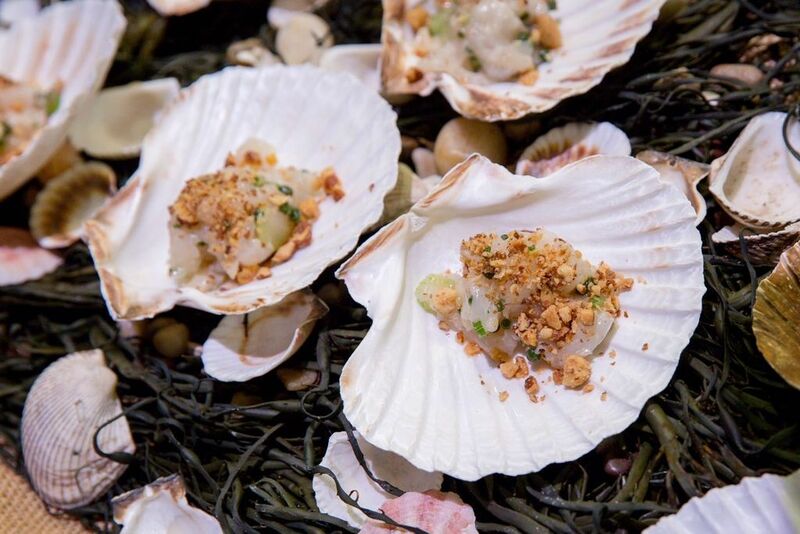 The phenomenon of great chefs delivering small plates at benefits designed to raise money for good works is neither new nor rare, though it was when we first staged a Tribute to James Beard in 1985. Indeed Monday’s gathering was the 33rd annual chefs’ tribute in this glorious space – I think of it as the center of New York if not the center of the world. 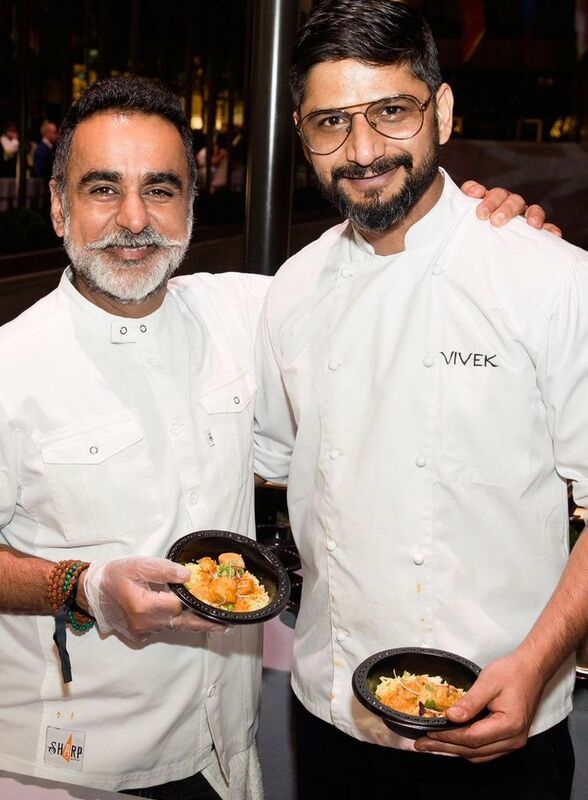 Tonight was a rally of chefs from the grand hotels of the nation and the world, along with a troupe of local star whisks. It would bring in close to one million dollars to help Citymeals on Wheels deliver the 2.2 million meals it will serve in the next fiscal year to our city’s needy homebound elderly. 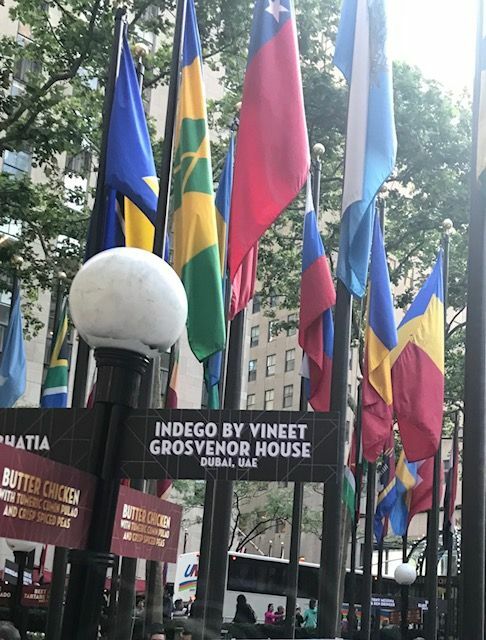 Signs marked the station of Indego restaurant by Vineet Batia Grosvenor House in Dubai and UAE. I’ve always felt that the delicious decadence of these feasts is more than justified by the good it helps us finance. The ticket fees, sponsorships and gifts of VIP regulars go toward a simple weekend or holiday meal – chicken, carrots, a salad, a carton of milk, and coffee or tea – meals not covered by government funds, delivered by Citymeals providers. Marc Forgione does veal tartare at post next to dad Larry Forgione, event co-founder with Jonathan Waxman. Maine scallop crudo with green fennel & oranges preserves by Josh Berry, the Press Hotel, Portland, Maine. 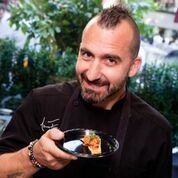 As New Yorkers we can eat Marc Forgione’s or Jonathan Waxman’s food anytime, though maybe not Marc’s veal tartare with pizza flavors served tonight or his father Larry’s Sonoma-pastured-lamb ragout or Waxman’s Maine lobster rolls with green garlic mayo. But Monday’s banquet is orchestrated mostly by chefs you may never have heard. Not the usual chef stars but executive from star hotels. They seem thrilled to be here. We taste the quinoa tabbouleh with Andean flavors by Carlos Pardo from the Sumaq Machu Picchu Hotel, melon gelée with almonds of Paco Pérez from the Ritz- Carlton Hotel Arts in Barcelona, and guinea hen terrine with pickled rhubarb form Cassidee Dabney of the Barn at Blackberry Farm in Tennessee. 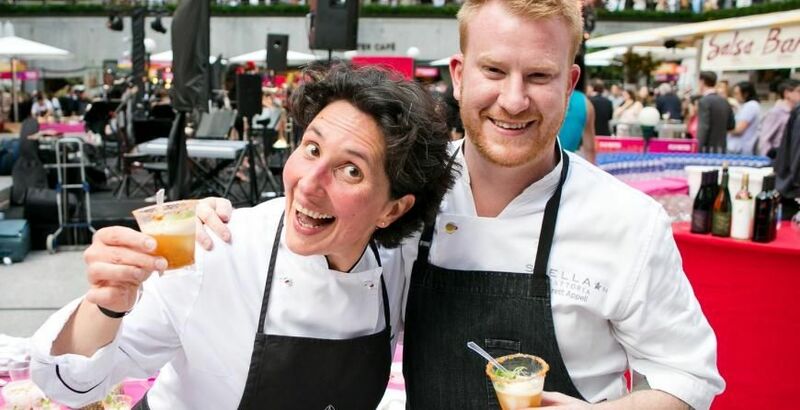 Silvana Vivoli of Vivoli Gelateria in Florence and Macy’s with Jarrett Appell of Stella 34 at Macy’s. The dancers do a jitterbug. While the band, Noah Bless Music, staged as always in front of the golden Prometheus played swing and guests joined a jitterbugging duo of professional dancers, I finally collapsed in the Rock Center Café and let friends bring me a duo of Japanese Wagyu by Raymond Weber from Wolfgang Puck’s downtown Cut and chocolate cookies and bon bons from Jacques Torres’ Chocolate Extravaganza. 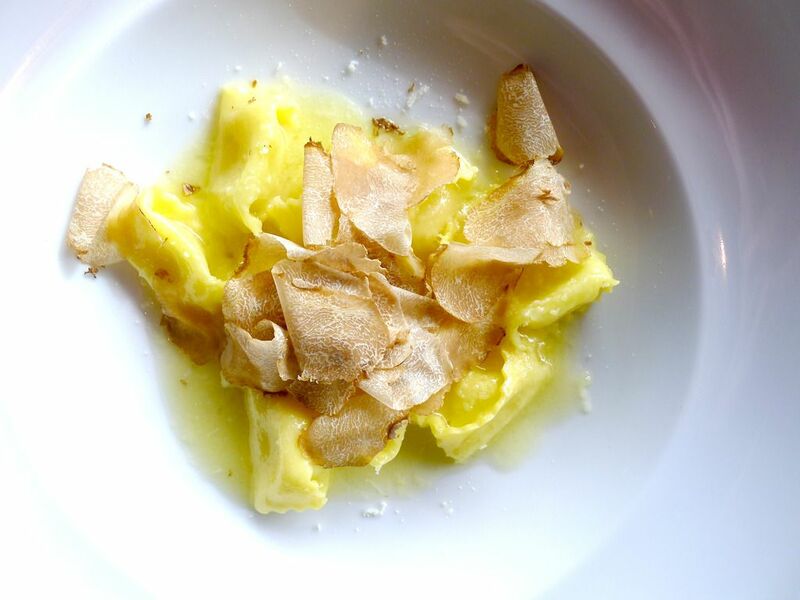 A friend took me to dinner at Lincoln and paid the freight for fresh white truffles on our agnolotti. 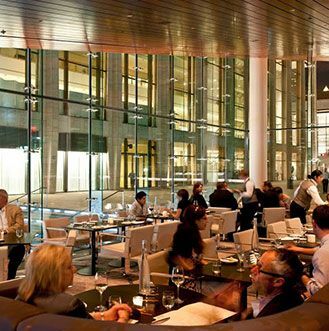 I’ve been a regular at Lincoln Ristorante since it overcame its first stumbling moments on the edge of Lincoln Center. I’m a fan not just because it’s so close to my home, and not just because it’s an advertiser. I find the sweeping expanse romantic and elegant, with unusual space between tables. I favor a particular spot that looks out to the shimmering pool in one direction and into the kitchen in another. The glass walled ristorante has serene views from almost every table. My favorite looks at the pool. I bring friends from out of town and pilgrims from across town, filmmakers and freelance writers, and gentlemen callers and not so gentlemanly callers. How many new wrinkles in Jonathan Benno’s pastas did my pals and I share in Benno’s six years behind glass in the kitchen? It was always exciting to see what the changing seasons or a new regional focus would bring. 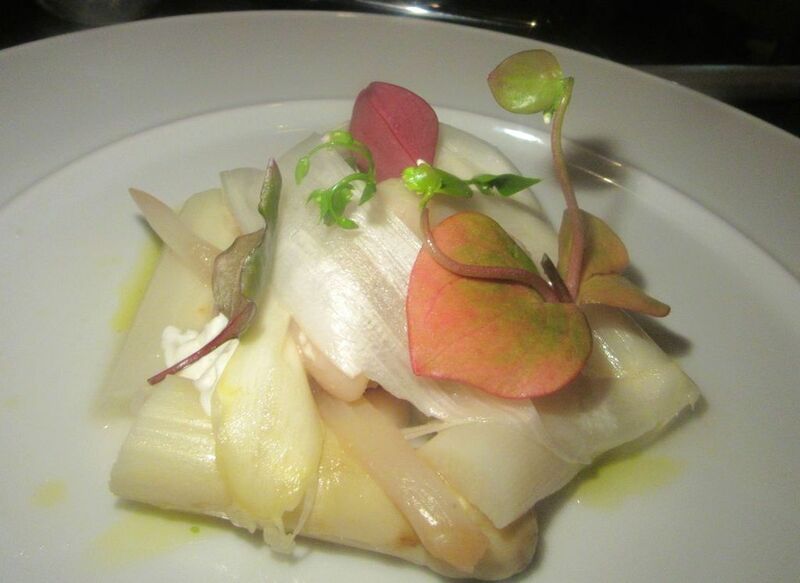 One evening no one was willing to share white asparagus so we asked for two orders. I was shocked when Benno left. I worried that the new chef, Shea Gallante, would not live up to his taste and creativity, though I certainly fell hard for Gallante’s food at Ciano. But I’m finding new favorites and I’ve never stopped loving the eggplant, a side I often choose as my dinner. Lunch begins with bread sticks, focaccia, ricotta spread, and a collection of amuses. Nick Valenti – the host of our Citymeals celebrations in the Rockefeller Center Garden for 33 years and the power and creator of Lincoln – requested Gallente to orchestrate a lunch last Friday for Citymeals Executive Director Beth Shapiro, our co-presidents Daniel Boulud and Bob Grimes, and me to discuss ways to make next year’s tribute better, equally delicious and more profitable. We all took notes. The tuna carpaccio rolled around fresh market herbs that we ate is similar to one on the current menu. The energy was powerful, passions intense, and between bursts of creative input, we ate lunch. I asked for more of the small, cheesy breadsticks. I always do. Then the amuse arrived: a little tartlette of roasted tomato, a small roasted pepper calzone and a fruit gazpacho. Just two mushroom dumplings each is the perfect amount of pasta after so many starters and fish yet to come. 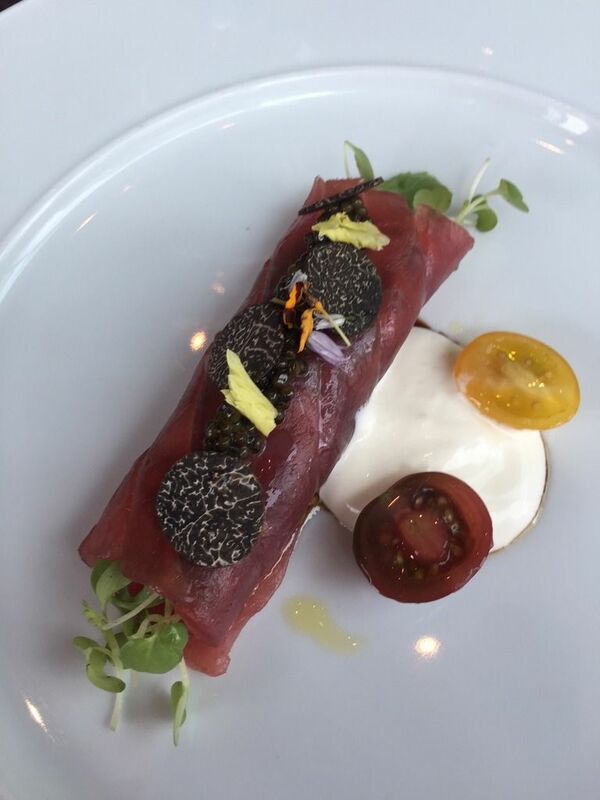 The chef’s tuna carpaccio rolled around spring herbs with radishes resembled an item on the menu but with a rich upgrade of Beluga caviar and black truffles from Australia. 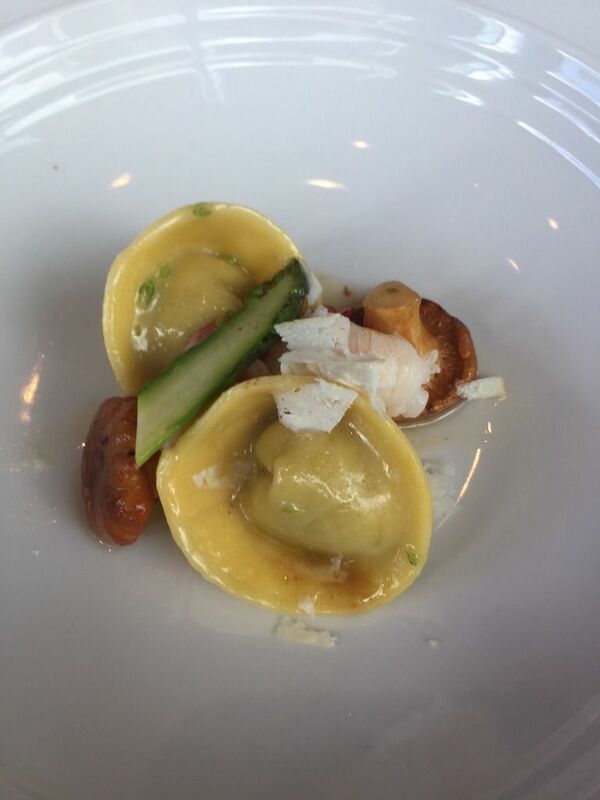 Pasta packages were banked with wild mushrooms, chanterelles, Maine lobster and garlic scrapes. 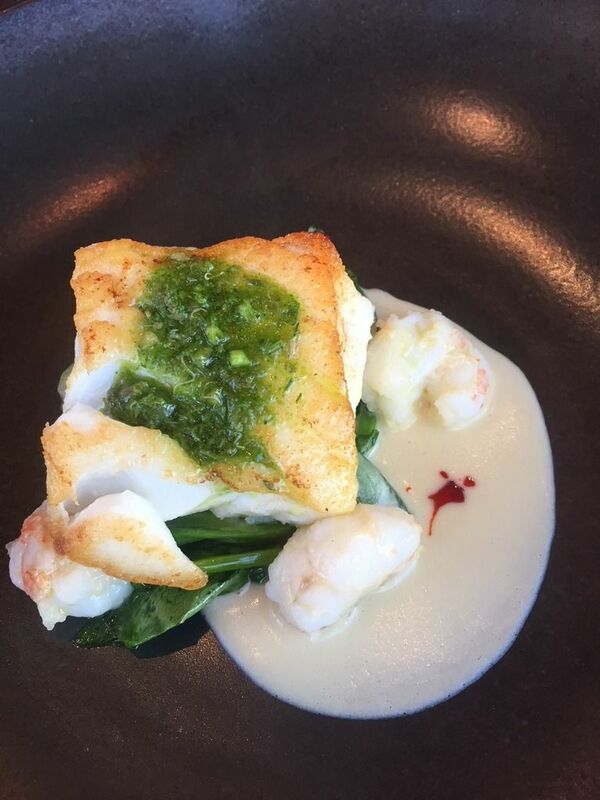 Sautéed cod with Maine lobster, and green spring vegetables is served on a delicate purée. The fish was a lush sautéed cod with market peas, favas and sweet pea leaves on a purée of white beans and vegetables simmered in broth. 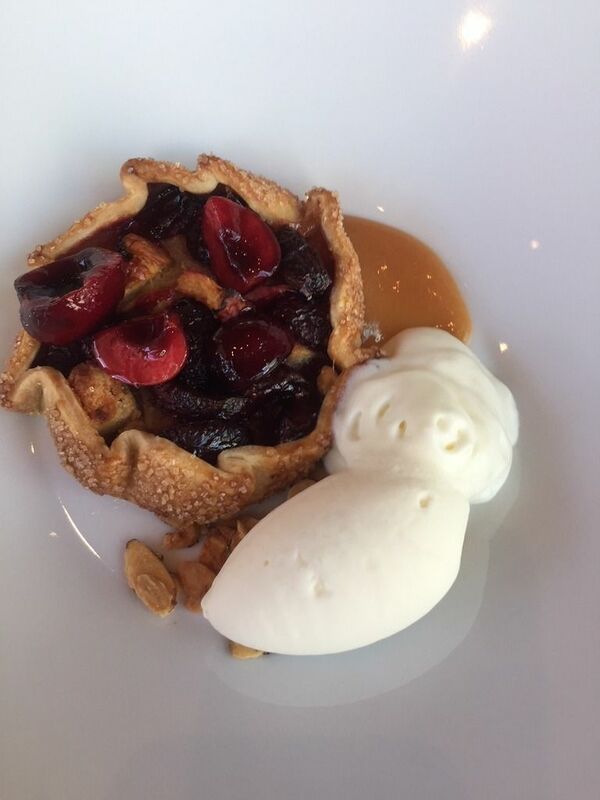 Lincoln’s gifted pastry chef, Richard Capizzi, sent out a nectarine and cherry tart with fior di latte gelato and whipped cream. Pastry chef Richard Capizza sends out a rustic nectarine and cherry tart with gelato and whipped cream. It wasn’t easy to rise gracefully at the end. The muchness of it all was a long way from my usual salad at the desk. But we had begun organizing the challenge of the 34th Tribute next June. And we are determined to make it a bigger source of income, aware that budgets in the coming years face the prospect meals will become more expensive. 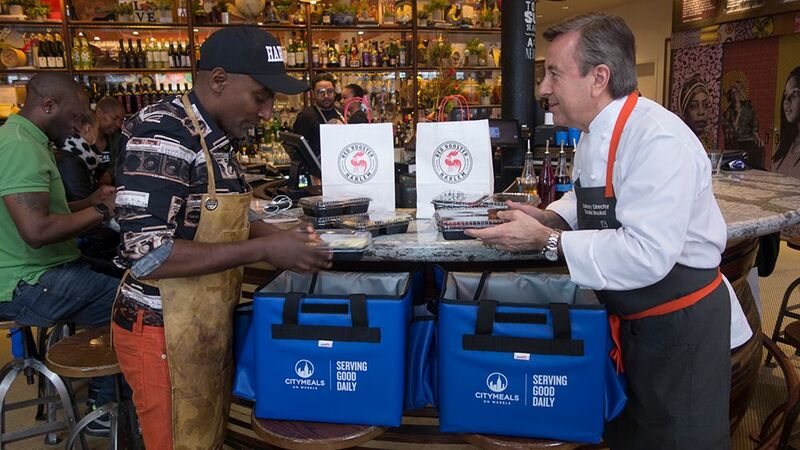 Chefs Marcus Samuelson and Daniel Boulud prepare to make personal meal deliveries to launch Harlem Eatup. All of us have delivered meals to the frail and ailing neighbors we help feed. 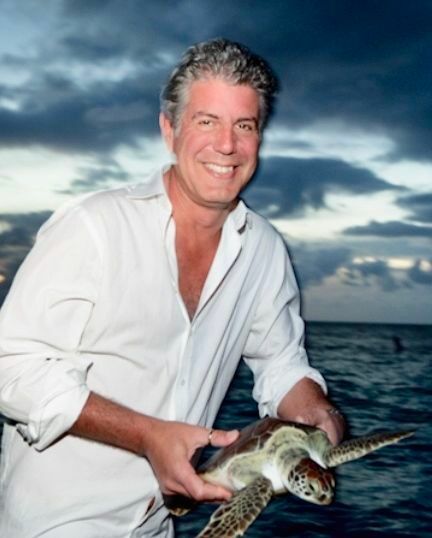 Daniel and his chefs and the Patina restaurants and many other restaurants have sent special meals by the hundreds or more to different neighborhoods, and made personal deliveries in the five boroughs. We can never forget that the elderly are New York City’s fastest growing population. During our meeting Daniel disappeared to take this photo of himself with everyone on the Lincoln kitchen. 142 West 65th Street between Broadway/Columbus and Amsterdam Avenues. 212 359 6500. Monday and Tuesday 5 pm to 10:30 pm. Lunch Wednesday, Thursday and Friday noon to 2 pm, Saturday 11:30 am to 2 pm. Sunday 11:30 am to 2:20 pm. Dinner Wednesday 5 pm to 10:30 pm, Thursday, Friday and Saturday 5 to 11 pm. Sunday 5 pm to 10:30 pm.